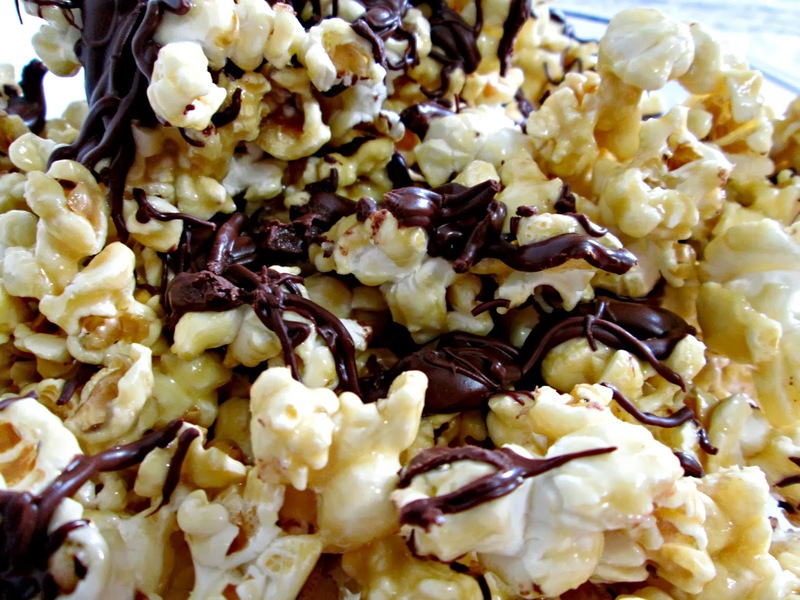 I was surfing Pinterest and I came across this awesome, easy recipe for Caramel Chocolate Popcorn. I modified it just a little bit and decided to whip it up today! You can find the original recipe HERE. I doubled this recipe so that it was enough to feed my family of 5. If you are just making this yourself, follow the original recipe. Enjoy! Using a medium sauce pan, melt butter over medium heat. Add in brown sugar, corn syrup and vanilla. Stir to combine. Add in marshmallow cream and stir until completely melted and mixture is smooth. Place popped popcorn, careful not to add kernels, to a large mixing bowl. It's practically impossible to keep all kernels out, but just do the best you can. 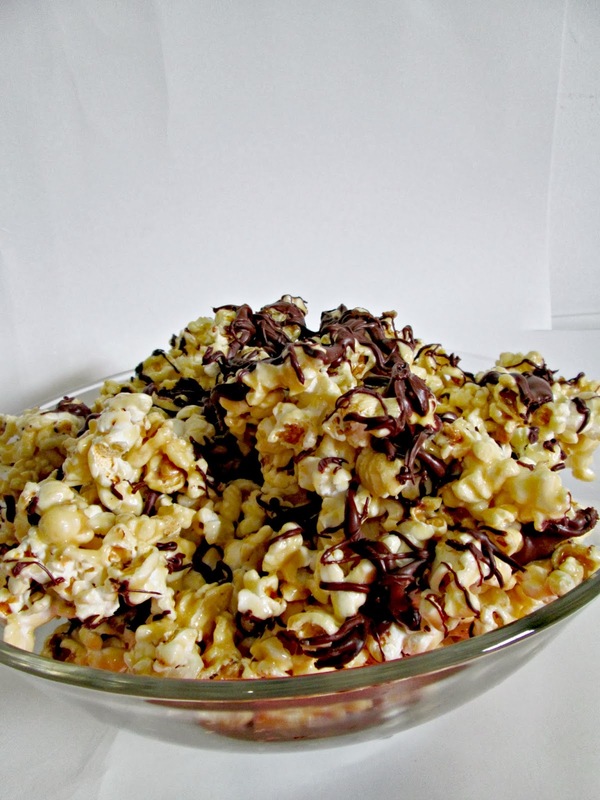 Drizzle caramel mixture over popcorn and toss to combine. Mixture will be very sticky and harden fast so do this quickly. Spread wax paper on a large cookie sheet. Spread the caramel popcorn on the cookie sheet. Add chocolate chips to a ziplock bag. Melt in the microwave in 15 second increments until chocolate is melted. Seal the bag and knead it to mix together. Snip the end of a corner of the bag off and drizzle it on the popcorn. Don't snip off a teeny tiny corner, or you'll end up squeezing it too hard to get the chocolate out and bust the bag like I did. Oops! Just snip a decent size hole. Leave Popcorn on cookie sheet for a while so that the chocolate and caramel mixture can harden. Store in an airtight container. Viola!